A few days later, I was in the shower (or on the subway, or some other place where Google isn't immediately accessible), and it occurred to me that I could just search for "kola tonic nyc" or some such -- this is a huge city, after all, and it seemed likely that there'd be some sort of South African expat shop that might stock the stuff. But the next time I was in front of a computer, I'd forgotten all about it. Fast forward to a couple days ago: I was in Fort Greene, Brooklyn, after visiting a friend in the hospital, and I walked past a store with one of those kiddie rides outside. What made me stop, however, was that the fiberglass airplane had been lovingly painted in the livery of South African Airways. Curious, I poked my head in the door and found myself in this South African restaurant and shop...and wouldn't you know it, they were happy to sell me a bottle of Rose's Kola Tonic. The fact that you noticed the toy airplane's paintjob, and that's what clued you in to the store's national origin, is so amazing. Was there any reason that you felt the need to post that same comment literally 177 times? I've deleted all but one. Kindly restrict yourself to one identical comment at a time, okay? According to this site, a can of Coca-Cola Classic contains 34.5 mg of caffeine, a serving of espresso contains 77mg, a can of Red Bull contains 80mg, and a cup of drip coffee tops the list at 145mg. So does this stuff have a lot of caffeine in it? Sure. I wouldn't recommend drinking it straight...but who'd want to? I'm drinking the stuff an ounce at a time. Please be advised that further to the below; we can confirm the caffeine contents as below. The caffeine content of Roses Kola Tonic is stated on the label as 150mg/l in the diluted product, which is equal to 1050mg/l in the concentrated syrup or 787.5mg/750ml in the 750ml bottle. I trust the above is in order; and would also like to express our sincere gratitude for the patience you have exercised while awaiting the response. So that's 31mg per ounce of caffeine in undiluted Kola Tonic...slightly less caffeine than in a 12oz. can of Coca-Cola Classic. I've been trying to find Rose's Kola Tonic online and have been irritated to discover that on every single site that mentions Kola Tonic that also allows user comments, Pieter de Waal has spammed his story about his friend dying and RKT being "toxic." It's not clear to me how he came to the conclusion that his friend who "damaged his liver by alcohol abuse" was killed my an innocuous cola syrup instead of, I don't know, maybe a liver damaged by alcohol abuse? So I just want to reiterate that the syrup is safe. Even if you drank a whole bottle (of the undiluted, concentrated syrup) you would surely regret it, but you would not die. kola tonic an lemonade is good . . .
My family is from South Africa, and I grew up drinking Kola tonic with Sprite, and a some mint leaves. Delicious. The Filmograph is also excellent. whenever I went to the yacht club in Cape Town as a young boy, the drink I would ask for from the bar was a snake juice. this was the barmen's name for a kola tonic and lemonade. This looked like a proper cocktail, so made me feel like I was playing the part in this fancy establishment, and tasted absolutely amazing! we didn't keep kola tonic at home so it was always a real treat. And the name given to it by the barmen made me feel like a real tough guy! I've been to South Africa several times and and love love love "Rose's" Kola Tonic and Ginger Ale or Diet Sprite! My husband goes once a year for business and I've just found out that it's a wonder cure for my chronic headaches. I'm down to under half a bottle he brought home this summer. Does anyone know of somewhere to order this in the states??? Please - any information would be appreciated! Thank you. I've used up my bottle of Kola Tonic. Have had no luck trying to order it online. Does anyone know ANYWHERE to find this product in the states? Does anyone from the states regularly read this post? Is it possible to find "Roses" Tiger Brand Kola Tonic in the US? Thanks again. 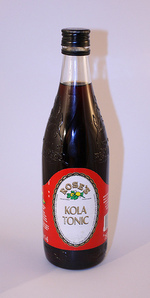 I've been looking into the situation - talking to several companies that have imported "Roses" Kola Tonic in the past and have found out that in the past year it has been banned from being shipped into the US. It has to do with one of the dyes in the coloring. It is illegal for it to come into the country. Will have to wait until I visit South Africa next year to have my wonderful drink. Good things never last. Shame. Thats really terrible that its illegal to import anymore. Im sitting in Cape Town, overlooking the mountain (Table Mountain) sipping on some Kola tonic, lemonade and Jack Daniels. Now thats a great combo! And makes the classic drink a little more adult! I used to get Roses Kola Tonic at Madiba's shop and also African Hut online -- but not for several years. I googled and found this FDA Import Refusal Report which lists several labeling issues and also "UNSAFE COL 402(c), 801(a)(3); ADULTERATION: The article appears to be, or to bear or contain a color additive which is unsafe within the meaning of Section 721(a). " Michael Staley,s Detective Kubu usesitin his favorite Steelworks drink.